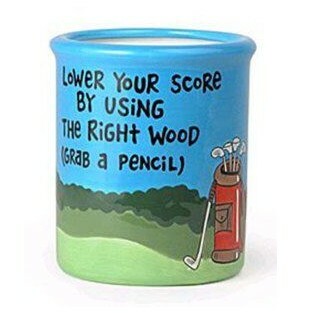 Features the quip "Lower Your Score By Using The Right Wood (Grab a Pencil)"
This large, humorous pencil cup from Our Name is Mud features the quip "Lower Your Score By Using The Right Wood (Grab a Pencil)" on a golf course scene. This is a fun and unique gift for every golfer. All Our Name is Mud products are safe for use in microwave and dishwasher. Industry leader Our Name is Mud is known across the U.S. for their high quality and quirky giftware. Their products are all hand painted and made from lead-free, high density dolomite ceramic, the most chip-resistant and highest quality earthenware on the market. Each piece is a perfect marriage of art and functionality and are all made to be enjoyed on a daily basis.